Chicken Dak Bungalow or Chicken Dak Banglow is easy to make and crowd pleaser dish with maximum flavour! Some people also called it Chicken Dak Bangla. 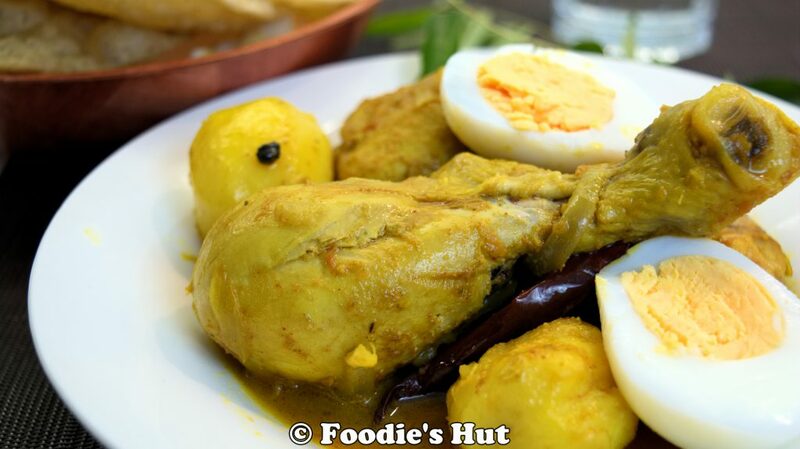 This Chicken recipe is an Anglo–Indian dish. The original recipe was Chicken Dak Bangla roast. Chicken Dak Bungalow tastes best with Indian Paratha or Porota, but sometimes I like to serve the dish with Luchi. In a mixing bowl add chicken. Add about 1 tbsp. mustard oil. After mixing the marinade, cover with a lid and put it into the refrigerator for at least 30 minutes. It will taste best if marinate for overnight. In a heavy duty pan over medium to medium-high heat, heat some oil. Marinate baby potatoes with salt and turmeric powder. Add marinated potatoes into the hot oil and over medium heat cook for few minutes. When potatoes turn into golden colour, remove them from oil. Temper the oil with black pepper, dry red chillies and curry leaves. Add sliced onion, salt and cook for few minutes. When onions turn into pink colour, remove from oil and transfer on a plate. Add marinated chicken into the same hot pan, add salt to taste and some water. Cover with a lid and over high heat bring to boil. Reduce the heat into medium-low, add fried potatoes into the pan. Allow to simmer for at least 15 minutes. Add garam masala, fried onion, stir well. Cover with a lid and cook further for 5 to 7 minutes or until chicken cooked through. Give 10 to15 minutes standing time before serve.